As Laura Spencer Collins, Genie Francis has been a beloved member of the canvas on ABC’s long running daytime drama General Hospital since 1977. The wedding of Luke and Laura made soap opera history as the most watched daytime episode. Genie Francis began playing Laura when she was still a teenager. The character has matured into a woman with children and grandchildren but still remained strong and determined to protect those she loves. When residents of Charles Street faced losing their homes due to an expansion project spearheaded by the late Jim Harvey, Laura took a stand and threw her hat into the ring by deciding to run for mayor against Ned Quartermaine (Wally Kurth). Then, grandson Spencer Cassadine injured himself in a skiing accident forcing Laura to withdraw from the race and leave her husband Dr. Kevin Collins (Jon Lindstrom) and Port Charles to go to France to take care of Spencer. 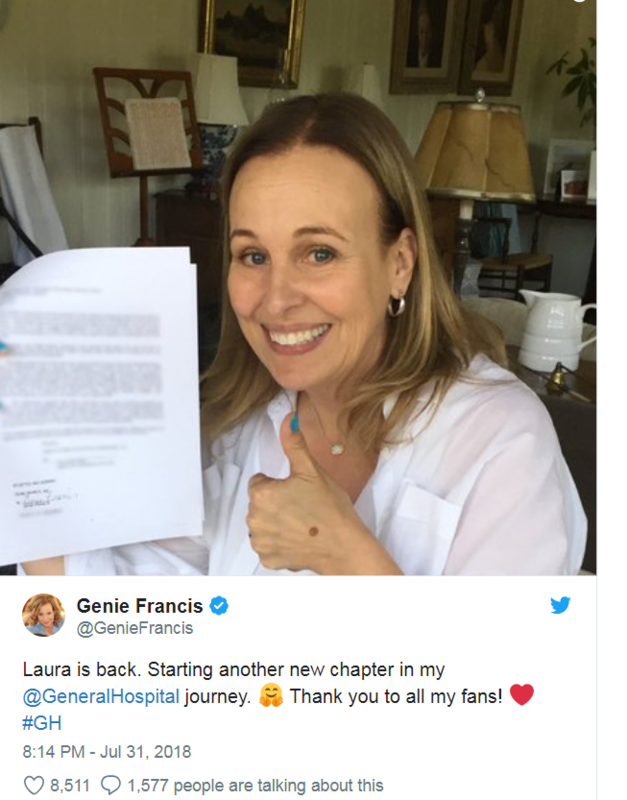 To the chagrin of General Hospital fans, in January 2018 Genie Francis was off the show. Gone but not forgotten, Francis’ fans protested her departure and were vocal in their desire for her return. Less than a year later, it was announced that Genie Francis and Laura would be returning to Port Charles. Will Laura be able to sense a change in her husband Dr. Kevin Collins? His psychotic twin brother Ryan Chamberlain knocked Kevin unconscious, drugged him, has him locked in Ferncliff and switched places with him. What danger will Laura find herself in? Stay tuned. 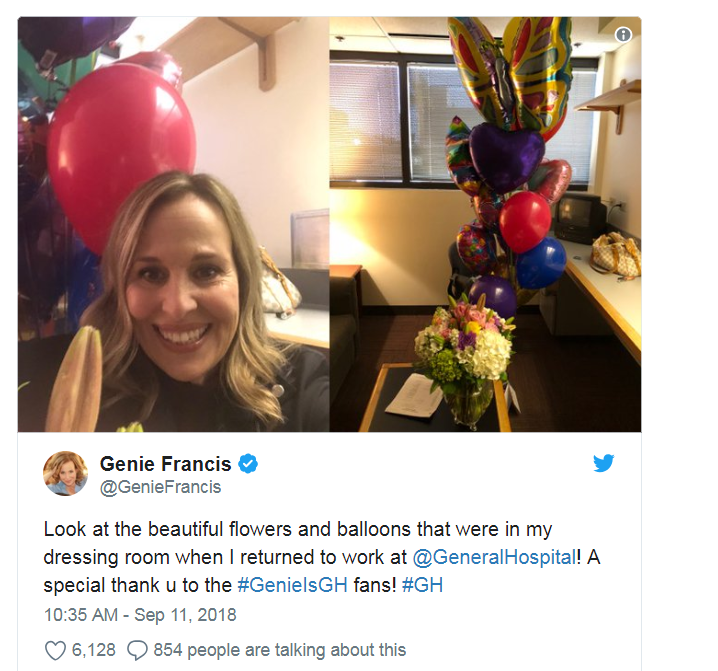 In the meantime, welcome back to General Hospital Genie Francis!